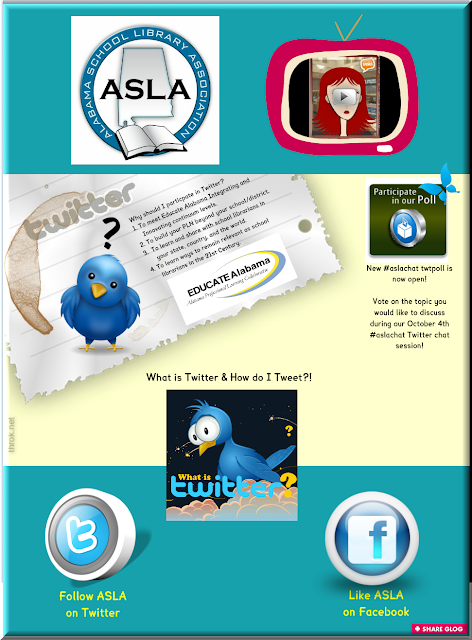 The Incredibly True Adventures of an EdTech Trailblazer: ASLA Twitter Chat Sessions-Grow Your PLN With Us! ASLA (Alabama School Library Association) is a professional organization dedicated to the improvement of instruction through the utilization of media and technology. It provides a forum for school library media specialists, administrators, curriculum specialists, teachers, library media educators, graduate students, professional association leaders, and retired library media professionals, to promote excellence in education in Alabama through effective school library media programs. ASLA is the state affiliate of the Association for Educational Communications and Technology, the American Association of School Librarians, and the Alabama Education Association.